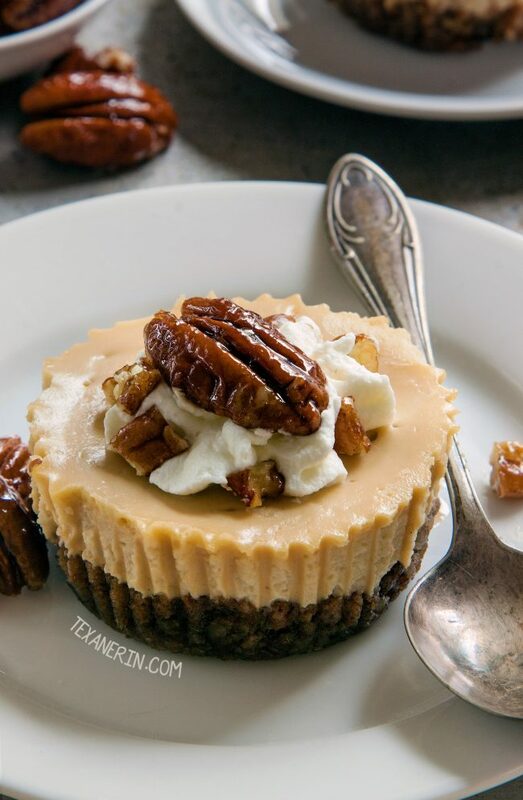 These maple cheesecakes have a grain-free pecan crust but can also be made with graham crackers for a whole grain, gluten-free or traditional graham cracker crust! This is the second year I almost didn’t post this recipe because of the pictures. I absolutely hate these pictures. And I didn’t like the pictures that I took last year. I just can’t photograph these things! These mini maple cheesecakes also aren’t the prettiest cheesecakes out there. I didn’t pay attention to my own directions and didn’t remove the liners before refrigerating them. So now you can see what happens if you take them off after chilling! It leaves their edges looking a little jagged. I also took the hardly cooled and still very soft cheesecakes and put them in a tupperware container that was too small to fit them all nicely. So they kind of got smushed. I can’t guarantee it but I’m pretty sure yours will come out looking much better! I used a scaled down version of the crust in my mini caramel pecan tarts recipe. In those, you bake the crust and then pour the caramel pecans over it. It yields a wonderful, graham cracker-like crust. With these, you’re pouring a very wet mixture over the baked crusts and putting them back in the oven for 30 minutes. So the crusts aren’t nearly as crisp but I think they fit the cheesecake perfectly! If you don’t want to use this grain-free crust, you can use a graham cracker crust (you can find the recipe for that below the instructions). You can of course use regular, gluten-free or whole wheat graham crackers. Make sure to use a darker maple syrup to get a nice maple flavor in these cheesecakes! The new grading system and the American vs. Canadian system makes it so confusing. Just don’t use the lightest stuff! You want what was formerly called Grade B. I link to some syrups I recommend in the recipe. Please see the notes below for the graham cracker crust! Preheat the oven to 375°F (190°C). Line a muffin pan with 12 muffin liners. Firmly press about 5 teaspoons (23 grams) of the crust mixture onto the bottom of the each liner. Try to press it in the nooks and crannies of the muffin liner. Bake for 8-10 minutes or until lightly browned. Let cool for at least 15 minutes while preparing the rest of the recipe. Don't skimp on the cooling time or the crusts will be soggy (they won't be crisp after baking, but they shouldn't be soggy). Lower the temperature to 275 °F (135 °C). Using an electric hand mixer or a stand mixer fitted with the beater attachment, beat the cream cheese and maple syrup at medium speed until light and creamy. Add the vanilla and salt and beat until combined. Beat in the eggs on low, one at a time, and just until well incorporated. Do not over mix! Fill each liner all the way full with the batter and bake for 30 minutes or until the centers of the cheesecakes jiggle just slightly when the pan is tapped. Let cool in the pan for about 1 1/2 hours and then remove the paper liners from the cheesecakes. Refrigerate for up to 4 days. Top with whipped cream and candied pecans right before serving. The pecans will start to "melt" if left on the whipped cream too long before serving. Mix together until combined and use about 4 teaspoons of mixture per liner. Bake at 325 °F (163 °C) for about 6-8 minutes or until they no longer appear wet on the surface. Let cool for 15 minutes before filling with the cheesecake batter. If you live outside of North America and have the kind of cream cheese that's meant for toast (that comes in a little plastic tub) rather than American style brick cream cheese, then get 600 grams of cream cheese, place it in the center of a cheesecloth, and wring out the liquid until you have 450 grams of cream cheese left. 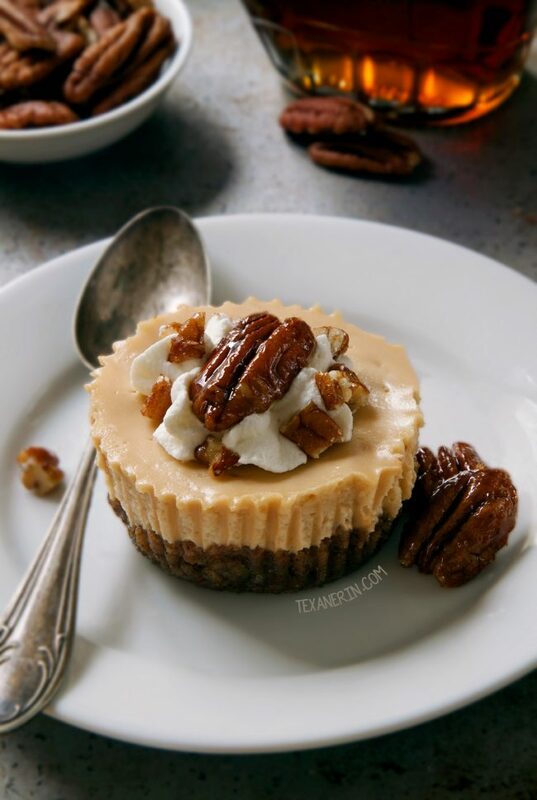 22 comments on “Maple Cheesecakes with Pecan Crust (grain-free, whole grain, traditional options)” — Add one! Thanks! And yes, I think these would freeze well. :) I hope you’ll enjoy them! These are precious definitely want to make them! The pictures turned out wonderful! I need to make these! These are SO cute! These would be perfect for Thanksgiving! I want 2 or 3 of these cute cheesecakes! Individual desserts are my favorite things to make – perfect for the holidays! Everything is cuter when it is in a little size! I love that you included all different kinds of options which makes it a great recipe for families with allergies. These sound great! I love all the personal sized portions you make. These maple pecans look delish. I wish I had some of them and the walnuts also. YUM!!! These are so perfect! I am printing this and sending to my Mom to see if she wants to make them and bring to Thanksgiving as one of our desserts!